What’s your home amp of choice? We get a lot of great feedback from you Blog Of Tone readers, and one theme seems to be recurring a lot at the moment: namely, that we guitarists want smaller, lower powered tube amps that we can crank at home to get those amazing tones at manageable levels. This, as usual, got us wondering – are tube amps generally too loud for home use, and if so, what are the other options for us if we don’t want to sacrifice our precious tone too much? What’s your number one amp of choice at the moment? That’s a question that used to be way more relevant than it is today. In times past, most guitarists stuck with one main amp squeeze for gigs, practicing and studio time – if they were lucky enough to get the opportunity to record at all, that is. These days, though, leaps in technology – coupled with the increased amount of disposable income we all have to spend on our hobbies – mean that we all have plenty more gear than we used to. Back in the 60s, for example, a new Les Paul or Stratocaster could cost close to an average yearly salary for a working class player. These days, most of us can afford to wheel and deal a new piece of gear every few months, if we’re serious about it. Plus, there’s way more choice than there was before. Amps (and guitars, and everything else!) now come in all shapes and sizes, from the dinky lunchbox generation to sturdy combos and imposing head and cab setups. Finding a great amp to play through at home is essential if you’re a guitar player. But it’s not that easy, especially if you want the same amp to also double up as a crowd-slaying gigging machine! And lots of us own all three! Or at least a couple – one for home playing, and one for gigs. Oh, and we haven’t even started on digital options yet. But the crux of today’s issue is that we’re seeing lots of players in a bit of a tonal bind. They want those great tube tones – the ones they insist on using onstage to wow the crowds – at home volume levels, and they want them now, and with the minimum of fuss. So, how to get them? Well, the good news is that you have plenty of options here. And we don’t just mean turning the volume down. Because we all know that doesn’t work. The first option doesn’t even involve spending any money, which is nice. It might not be possible if your amp’s a total monster, but if it does do reasonable volumes, you can consider how, when and where you’re playing it at home. There’s plenty of little things you can do to curb your noise pollution levels, from closing all the windows and doors before you plug in to some more serious stuff (danger: involves rearranging rooms around amps!). For more details on all that, check out this previous blog covering the topic right here. One other benefit of many modern-day amps is their connectivity. 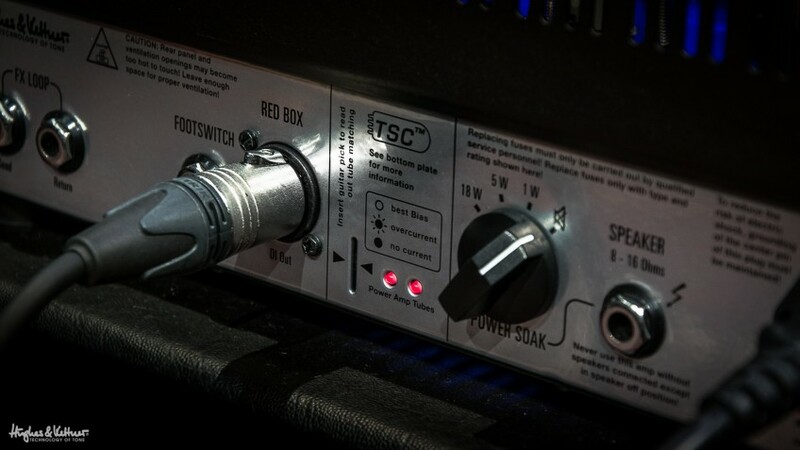 Some, like this one, feature DI outputs, which enable you to run your amp directly to your mixer or computer, effectively allowing silent home playing and recording – and this feature’s great for gigging without a cab too. But if your problem’s more serious – read louder – than that, there’s still plenty of solutions. If you absolutely must continue with said earsplitting amp at home, then consider getting hold of a power attenuator. A device that sits between your amp’s output and the speaker, an attenuator reduces the sheer volume of your amp by either grounding – or converting into heat – some of your signal. There’s plenty of attenuators out there on the market. Some are fantastic, some not so good – but almost every guitarist out there would agree that they affect your tone in some way. In fact, perhaps their rather unfortunate nickname among some players – tone suckers – tells you more than this 1,000 word blog ever could! If this rings alarm bells with you, then you may need to be more drastic and consider a new amp. There are tube amps that come with built-in attenuators, or power soaks, which means (a) that you avoid having to fork out for an attenuator, and (b) that they probably have variable volume and/or power level settings, making them suitable for both the stage and the home. One other advantage here is that these amps will have been designed and developed to sound great at these lower volumes as standard, so if the amp sounds good when you try it in the store, you can be sure it’s going to be the same when you get it home. The other option is, of course, the lunchbox amp. Now, we’ve written about small amps plenty of times before (here and here, to give but two examples), but we’re still dumbstruck at how powerful and fat-sounding these diminutive little boxes can be! With lunchbox options available from 1 watt and upwards, there’s pretty much an amp to suit every set of circumstances, ability and neighbor hearing sensitivity level. A word of warning on tube amps, though – even 1 tube-powered watt is loud! And in some places, five watts can be too much. As crazy as that might sound, it’s definitely worth trying out the amp at full tilt before you decide to take it home and realize you’re actually going to be making enemies of everyone in the same apartment block. Trust us, we’ve been there. To come back to our original question in this blog, though, there are plenty of other ways to enjoy guitar at home. Many players simply go through their iPads or computers straight into DAWs. This can be a great option, especially if you’re one of those players who always likes to record your playing. Others like to noodle on an acoustic when they’re at home, and only crack out the electric when they go to practice with the band or play live. And many of us have a smaller solid state or modeling amp for playing at home. As well as being lighter and cheaper than most tube amps, digital options also tend to come with a far greater variety of built-in FX, and you can set the volume levels as low – or as high – as you want without sacrificing the tone too much. But, if you absolutely need to have tubes in your home life too, then all is quite clearly not lost. So tell us: how do you play at home? Do you stick to tubes, turned up to 11, and to hell with what everyone else thinks? Or have you found another – maybe digital, maybe not – solution? Either way, we’d love to know, so leave us your comments below! First published: January 30 2015. Most recent update: February 27 2015. I love my H&K Tube Meister for my home playing. I use a Marshall AFD-100 & two 4×12 cabs – have I done it right ? Wow! Guess we all have different home needs David 😉 But seriously, we came from a perspective of being a German amp makier based in Germany. Over here we have strict laws about noise levels in the home, particularly on evenings and weekends. We’re actually pretty jealous that you have something so powerful you can crank at home! That’s OK Derek – we guitarists all get a little GAS from time to time 😉 Nice collection anyway! I’m really getting into my home recording at the moment. I have also just got the Triamp MK3. I had been recording directly into Logic Pro with a Line 6 POD XT that I managed to get some really good sounds out of, but it was definitely missing something. – I don’t want to kill (or be killed by) my neighbours. – I have tried the Red Box AE direct but the line levels are still pretty weak when playing the amp at low volume… I’ve read that the line level is controlled by the master power amp volume, but doesn’t this defeat the purpose if you have to have a cab plugged in at all times as well? I have a feeling I know what you’re going to say next: get a power soak. Am I right? Would love to get your views and recommendations on how to get a juicy metal (not modern scooped, but more full sounding) sounds straight out of the Triamp MK3 – without either having any volume or just a little bit of volume out of the cab. If I’m recording at night, my daughters room is next door so I’m talking sub-acoustic guitar levels! You could actually make one yourself, using a crate that fits your cab (works easiest with a 1×12, of course) and a pillow. Another thing is, you do need to crank the Mark 3 to get the best tones, particularly when you’re doing high gain stuff. And you’ll probably want all three sets of power tubes in action too! Which takes you up to 150 watts of power. And, because you’Re doing metal, you’ll probably be using a 4×12, right? There’s actually no amazing fix here other than the power soak/attenuator or isolation cab option. Sadly, a built-in power soak was just not viable on the TriAmp – you’d need one of our Meister amps for that. Vox VT 30. Can’ beat it for sound quality and versatility. Also have a 30wt Marshall combo because NOTHING sounds like a Marshall except a Marshall. So if I need that sound (and we all do) I have it. Thank you for this excellent news on the global power soak for the GM — for me it will make the GM achieve its potential as an outstanding amp. Meanwhile, back to the issue of practicing, and gear, I often need to listen to a stereo recording, while learning or practicing a particular part. So its is useful to have the ability to take stereo input, but, for what I do, the guitar signal does not need to be stereo. Also we might also consider the difference between practice at home, vs on the road (e.g., hotel room). For practice while traveling, it is very important to have a very light, small, and very sturdy unit that can survive the checked baggage ordeal, but still sound good. On the road, I quite liked a small 2W Roland microcube, until it suddenly died (for no apparent reason). So I’m looking for a compact travel aid, and will continue to monitor this blog for ideas… Is H&K thinking of offering something in this part of the market? (there is already solid competition here, but another H&K option would be cool). That’s great to hear, and we’re looking forward to what everyone else thinks of it too! I agree it is cool 5W is sufficient for practice with bass and drums, and vocals over PA. I thought of saving each patch multiple times, once for each power soak level, of course. However this approach has some problems as a general solution. One is a management issue (it would be tedious, don’t you think), another is that it would limit one to 6 banks of 4 patches, to cover the 5 soak levels. 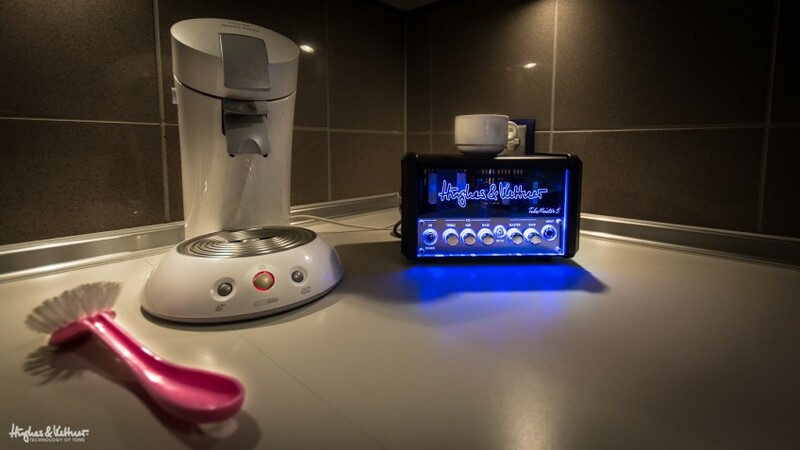 Will Hughes and Kettner provide a better solution, such as an override so the soak is simply set at the back of the amp, or are we stuck with the problem for ever? The preamp give me soaring leadtones anyway. I will make some patches for this mini volume. For livegigs I use 18w for dist and 36 for clean sounds. Only wish is for a non filtered line out. Hi ,I was lucky enough to win your 5 watt tube miester in gear magazine last year , I find it great for home practice and also for gigging , I use it with a swollen pickle fuzz pedal to give me that insanity tone !. When I first won it some of the other band members laughed and scoffed at it when they seen it , but when I plugged it in and played their jaws hit the floor and they are still shocked at how this little amp performs . My other amps range from 30 watt vox , to a 100w marshall jcm duel lead . I am very impressed with the 5 watt amp keep up the good work. Congratulations Mike, and glad you’ve got some good usage out of your prize! Yep, we’ve seen that jaws hitting the floor moment many times with the TubeMeister series, and the GrandMeister too. They can be proper LOUD if you crank them 😉 But of course they’re great for home practice too, and then you’ve got your 100 watter should you ever end up playing stadiums – you’re all set for anything with that combination… Have fun with your TM! I use a Soldano full stack to practice in my bedroom. It’s much quieter than 9 full stacks. Lots of nice little options there, sir – very cool! You’re covered that way for any level of quietness 😉 The Red Box opens up a whole load of possibilities, so we really recommend you spend a bit of time with it! i use my Line 6 Spider Valve HD 100 head for everything live practice and at home. Tons of tone with all the sound and affects available to me in this digital / tube driven amp. With 16 banks I have made the most out of the fact I can program setting for each application and store them on there own bank. Let face it who need to create 64 different sounds or setups when at best all you really need is 4 ( a clean tone , slight tube break up tone mid break up and all out rock tone) So I have created 4 tones I use for playing because guys let face it most amp only have at best 3 channels clean dirty and rock out so I just adjust the output on my channel volume to fit the environment and store it into it own bank and then all I have to do is turn up the master and let her eat when need be Also with the use of a power soak in the effect loop you can still drive the tubes without all the volume while still getting all the tone. With a simple change out from my 4×12 or full stack for gigging to a 2×12 for bedroom jamming. The fact is you can’t beat a tube head for the tonal qualitys and most of us will use effects anyway here I have the best of both worlds and a practical rig that works in all applications and the spider valve HD 100 works for me. Bogner tube with line 6 technoligy works best for me. Bottom line find what works for you and use it you can always us a soak to bring down the volume without sacrificing your tone and yes tube are great. Agreed Steve – what works best for each individual player is always the best solution. Sounds like you’ve found an option to cover you in every possible situation, which is pretty much the holy grail when it comes to amps! 😉 And another brownie point for the Master Volume too… Thanks for the great feedback! Is your GrandMeister too loud even on 1 Watt mode? The Boss is a cool, versatile option though, and perfect for recording practice, like you say! Recently picked up a TubeMeister 18. It’s pretty much got it covered for me – loud enough to practice and gig (tho I’ll be looking for a second cab when funds allow! ), and the power soak feature has it sorted for home. That said, even in 1W mode I can’t crank it up too far at home! Definitely think a built in power soak in a nice tube amp is the way to go! Right now, I use a GM36 on the 1 watt setting, through a 4×12 cabinet, for practice, and tuning sounds, saved as patches. when the band comes by for rehearsal, I shift to 5 watts. I have to copy all patches saved at 1 watt to the iPad app, change them all to 5W, and save them back to the amp before they arrive. I transfer the 1W pathches back to the amp when I next practice by myself. 1W is plenty loud to practice by oneself, but not quite with drums and bass. Hmm, interesting. You could maybe consider having two versions of each preset – one at 1 Watt, the other at 5. Then you wouldn’t have to reprogram the amp each time. Also, cool that 5 Watts can handle the bass and drums too! Do you play much clean stuff, or are you always on crunch/distortion sounds? To tell the truth I have a Tubmeister 18 for giging and practice its perfect but for overall great sound I play through a Yamaha THR 10X for bedroom jamming the options for small enviorments and sound quality there is only the kemper amp to sound as good. I have a slew of pedals. From clean funk to Creamy gained lead. Into 2 Quilter Tone Blocks. The Stereo thing is always way better for me to stand in front of. Would love a stereo amp head from you guys. Think about it, will ya? Your Triamp Mark 3 is making me seriously think about going back to a mono rig. That thing is a BEAST. First of all, I love this blog. Never posted a comment before, but love the topics and info. I use my 65 Deluxe Reverb Reissue. If I need overdrive, I just throw a pedal in there. Works great and the wife dosen’t complain. That’s always good right? It works great for me for home practice all the way up to full band gigs or recording. 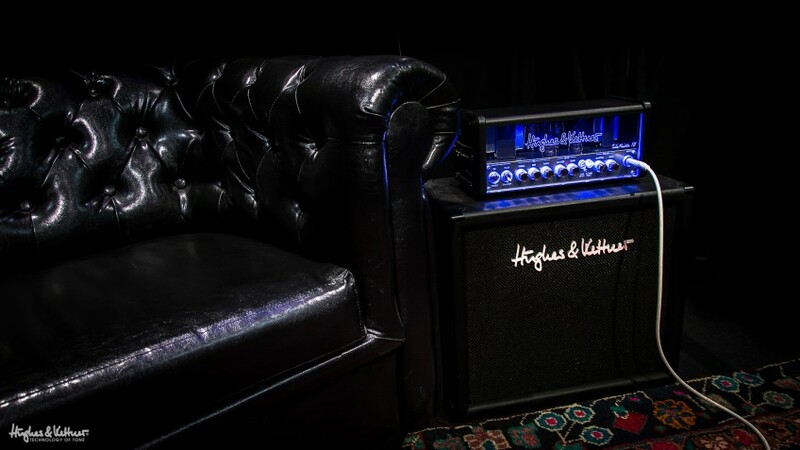 By the way, Hughes & Kettner gear is all top quality stuff. I hope to pick up one of their amps one of these days. And no, I’m not a paid endorser, lol. Yep, if you can get it past the wife, you’re on to a winner! 😉 Sounds like a great solution, using pedals for drive at home and having the one amp (and what an amp at that!) that can handle any situation you might need it for. Greets to the H&K team. Ha, you got lucky living where you do, clearly 😉 Not sure city people would manage with a Switchblade stack for too long! Train Wreck clone by Token amps with all NOS tubes and parts. Ran through Rock Crusher to get the tones at normal volume. I use high-gain JFET preamp (AMT Legend amps) into single-ended MOSFET class A 5W poweramp. Sounds better then all tube head. What, a TriAmp at civil volumes?! 😉 Well, we weren’t expecting that as the first comment, but cool nonetheless! All down to the master volumes, of course – glad it’s fulfilling that role well for you!